Ford is recalling certain 2013 Ford C-Max hybrid vehicles due to a roof issue, which may pose a dangerous risk to occupants. Ford’s latest recall involves 33,021 model year 2013 Ford C-Max hybrid cars manufactured between Jan. 19, 2012 and June 25, 2013. The affected vehicles fail to meet Federal Motor Vehicle Safety Standard No. 201, “Occupant Protection in Interior Impact,” which pertains to head injury risk. As a result, certain C-Max hybrid cars may not adequately protect occupants’ heads in the event of a crash, according to the National Highway Traffic Safety Administration. The recall does not affect C-Max hybrids with panoramic glass roofs. The NHTSA discovered the problem during vehicle safety testing. There have been no injuries or crashes reported, according to Ford. Ford will begin notifying customers of the recall next month. Authorized dealers will install energy absorbers between the headliner and the roof at no cost to the owner. In the meantime, customers may contact Ford customer relationship center at 1-866-436-7332. Ford’s recall number is 13C02. Owners may also contact the National Highway Traffic Safety Administration’s Vehicle Safety Hotline at 1-888-327-4236 or go to www.safercar.gov. The NHTSA recall number is 13V303000. 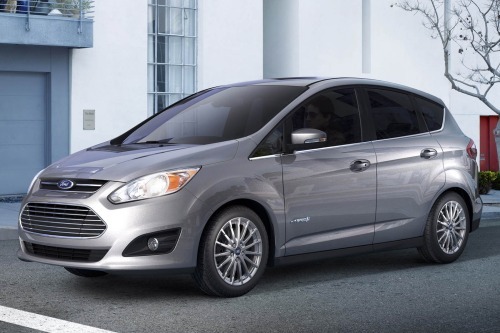 The news marks Ford’s second recall of the 2013 C-Max hybrid this year. In March, Ford recalled 6,500 model year 2013 Ford Focus, Escape and C-Max hybrid vehicles manufactured from Nov. 16-21, 2012 at Ford’s Michigan Assembly Plant. The recall concerns 5,675 vehicles in the Unites States and 859 in Canada. The vehicles in question may contain incorrectly installed rear door child locks. “The child lock may not engage when the operator uses normal turning force to activate the child lock, and the operator may incorrectly believe the child lock is engaged,” according to NHTSA documents. In addition to the two recalls, Ford is also dealing with a lawsuit claiming that the C-Max hybrid fails to deliver on its gas mileage claims. In April, disgruntled owners of 2013 Ford Fusion and C-Max hybrids filed a complaint in U.S. District Court in Philadelphia alleging that their vehicles provide considerably less fuel economy than the advertised 47 mpg. Click here to read Torque News' in-depth coverage of the Ford gas mileage lawsuit.